1The First Affiliated Hospital of Fujian Medical University, PR China. 2Department of Traditional Chinese Medicine, the First Affiliated Hospital of Fujian Medical University, PR China. 3Medical University of Fujian, PR China. Ischemia-reperfusion injury, Cardiomyocyte, Apoptosis, microRNA-21, PTEN/AKT/FOXO3a signaling pathway. Acute coronary syndrome has an extremely high mortality as the clinical emergency and severe cases. Early reperfusion treatment is the most effective treatment currently, but reperfusion injury is an unavoidable problem. The recovery of blood supply of Tissue or organs after ischemia may increase the damage of ischemic tissue or organs, which is called ischemia-reperfusion injury (I/R). I/R can induce the apoptosis of tissues and organs, and it occurs early in I/R injury. It is important to understand the mechanism of I/R injury for precaution. Micro RNA is a class of endogenous, non-coding, singlestranded RNA, involved in a variety of cardiovascular system physiological and pathological processes. MicroRNA-21 (miR-21)  is rich in cardiovascular disease and participates in the pathophysiological mechanism of various cardiovascular diseases. Many studies have shown that miR-21 has an antiapoptotic effect with unclear mechanism in I/R. Previous studies [2,3] found that phosphatase and tensin homologous gene (PTEN) that are deficient for chromosome 10 are the target gene of miR-21 in hypoxia-induced and I/R-induced cardiomyocyte apoptosis. It is found that PTEN/AKT/FOXO3a pathway is an important pathway involved in the regulation of apoptosis. PTEN can antagonize PI3K/Akt pathway and induce cell growth, differentiation, apoptosis and migration. The transcriptional activity of FOXO protein family (including FOXO1a, FOXO3a and FOXO4) is mainly through the regulation of phosphatidylinositol3 kinase/protein kinase B (P13K/AKT) pathway, which plays an important role in apoptosis. Therefore, we established I/R rat model to explore the effect of microRNA-21 on PTEN/AKT/FOXO3a signal transduction pathway and to study the mechanism of apoptosis in I/R process. Sixty adult clean male SD rats, body weight 250-300 g, provided by the experimental center. In-situ nick end labeling (TUNEL) detection kit (Roche); β- actin mouse anti-polyclonal antibody (Santa Crusz, USA); microRNA-21 recombinant lentivirus expression vector (Genomic Technology Co., Ltd.); total RNA extraction reagent Trizol (Invitrogen); PTEN rabbit anti-polyclonal antibody (Abcam Corporation, USA); RT-PCR kit (Beijing Tiangen Biochemical Technology Co.); p PTEN, AKT, pAKT, PAKTser473, pAKTThr308, pFOX03a, FOX03a and FasL polyclonal antibody (Santa Crusz, USA); low-temperature high-speed centrifuge (Sigma, USA); quantitative fluorometer (US ABI PRISM7500). I/R surgical methods referred to the previous literature . The chest and pericardium were open in the left edge of 2-4 sternal the intercostal space for the exposure of heart. In the right edge of the pulmonary artery cones and 0.5-1 cm of the edge of left ear, 6-0 silk was used to thread around the anterior. After placing a thick rubber tube in line knot, cardiac ischemia and reperfusion was simulated by tensioning and releasing the knot. After I/R modeling for 6 h, the heart was removed and rinsed with precooled PBS. The apex cordis was collected and placed in the methanol solution for 24 h.
Put tissue slice into 62°C incubator and stay overnight, and then put it into different concentration PK, and respectively put under 37°C to digest the slice for 30 min or 15 min. 10% of calf serum seal for 30 min under indoor temperature, adding 30 μ lTUNEL reaction mixture, putting into 37°C water to react for 1 h, TBS rinsing, adding 30 μl Coverter-AP (Anti-fluorescein antibodies-ALP) and place it under indoor temperature for 2 h, NBT/ BCIP+1 mmol/L levomisole developing, nuclear fast red redyeing. Select more than five high power fields in apoptosis area for each slice, accounting apoptosis rate of myocardial cell. The calculated apoptotic rate of cardiomyocytes was compared with that of the untreated group. The apoptotic rate of myocardial cells in I/R injury group was significantly higher than that in normal group (P<0.01), suggesting that I/R model was successful and I/R injury increased significantly Apoptotic rate (Figure 1). Figure 1: Establishment of MI/R rat model. I/R and non-surgical rat hearts were removed and cut, followed by repeated digestion of 0.1% trypsin and 0.1% collagenase. The cell suspension was filtered through a 200 mesh screen, washed with DMEM and placed in 5% CO2 at 37°C. Differential adherents were separated for 60 min and fibroblasts were discarded to obtain rat cardiomyocytes. There were normal group (Sham group), I/R group and I/R +microRNA-21 group (I/R+miR-21 group), among which: (1) Sham group: primary culture of non-surgical cardiomyocytes for 102 h; (2) I/R group: cultured of I/R cardiomyocytes for 102 h; (3) I/R+miR-21 group: After cultured with I/R cardiomyocytes for 48 h, pGC-FU-microRNA -21-GFP lentiviral vector was transfected into cardiomyocytes for 54 h.
Hoechst 33342 was used to detect the apoptotic rate of cardiomyocytes in each group. Myocardium cells were digested with 0.25% trypsin containing 500% EDTA for 5 minutes. 105-106 cells were suspended in 1 ml DMEM medium and beaten evenly, after which 10 μl Hoechst 33342 dye was added and incubated at 37°C for 10 min. Cardiomyocytes were centrifuged at 500-1000 r/min for 5 min at 4°C and the supernatant was discarded. 1.0 ml Buffer A working fluid suspension cells and 5 μl PI dye were added at room temperature for 5-15 min for mixing and observed under fluorescence microscopy. Normal cells had low blue/low red, apoptotic cells high blue/low red and necrotic cells low blue/ high red, a total of 200 cells. The apoptotic index=Positive apoptotic cells/total cells × 100%. After treated with TRIzol, the total RNA was extracted by chloroform. Reverse transcription was performed by RT-RT kit instructions at 37°C for 60 min. The PCR reaction was carried out according to the PCR primers and the probe sequence. The reaction conditions were as follows: 94°C pre-denaturation for 2 min, 94°C denaturation for 20 s, annealing at 60°C for 30 s, extending at 72°C for 30 s (a total of 40 cycles). PTEN and internal reference β-actin: cDNA was synthesized by reverse transcription at 65°C for 5 min, 42°C for 60 min, 70°C for 5 min. The reverse transcription product was reacted with PTEN primer and internal reference, respectively. The reaction conditions were: pre-denaturation at 94°C for 3 min, denaturation at 94°C for 30 s, annealing at 58°C for 30 s, extension at 72°C for 45 s, and cycling for 40 times. The relative expression of miR-21 and PTEN mRNA was detected. Cells were cleaved by RIPA according to the product description, and the total protein was obtained by centrifugation at 12°C r/min for 15 min. 10 μl of protein solution was used on the polyacrylamide gel electrophoresis under constant pressure 80 V until the edge of bromophenol blue entered into the separation gel for 10 min, then the voltage transferred to 120 V with constant pressure until the bromophenol blue electrophoresis close to the bottom of the separation gel. 5% skim milk powder/TBS-T closed 37°C 30 min. Transform film conditions: 1:400 Rabbit Anti-PTEN, 1:10000 Rabbit Anti-pPTEN, 1:10000 Rabbit Anti-AKT, 1:1000 Rabbit Anti-pAKTser743, 1:1000 Rabbit AntipAKTThr308, 1:10,000 Rabbit Anti FOX03a, 1:1000 Rabbit Anti-P FOX03a, 1:1000 mouse anti-β-actin polyclonal antibody 4°C overnight, TBS-T membrane for 10 min. goat anti-rabbit, goat anti-mouse secondary antibody labeled by Horseradish peroxidase were incubated at 4°C for 4 h. Color results of ECL luminous kit was analysed with BIO-RAD digital image processing system. SPSS19.0 software was used for statistical analysis. The results were analysed by t test or single factor analysis of variance. P<0.05 was defined as a significant difference. The results of Hoechst33342/PI test showed that the myocardial apoptosis rates of normal cardiomyocyte group (Sham group), I/R group and I/R+microRNA-21 group were (10.82 ± 1.23%), (70.54 ± 1.33%) and (29.37 ± 1.72%), respectively. 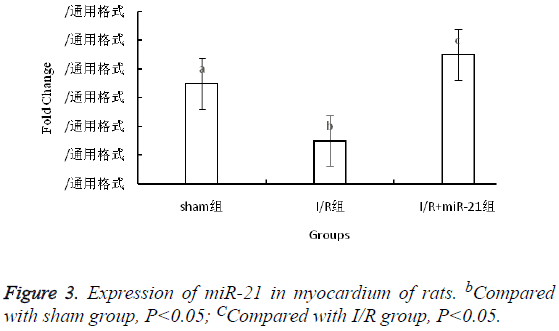 The apoptotic rate of cardiomyocytes in I/R group was significantly higher than that in Sham group (P<0.05), and the apoptotic rate of I/R+miR-21 group was significantly lower than that of I/R group (P<0.05). The results are in Figure 2. Figure 2: Myocardial cell apoptosis in groups tested by Hoechst33342/PI method (A: Sham group; B: I/R group; C: I/R +miR-21 group). 2-ΔΔCT method showed that compared with sham group, the expression of miR-21 in myocardium of I/R group was downregulated (P<0.05), and the expression of miR-21 in I/R +miR-21 group was higher than that in I/R group, about 3 times the I/R group (Figure 3). Figure 3: Expression of miR-21 in myocardium of rats. bCompared with sham group, P<0.05; CCompared with I/R group, P<0.05. The relative expression of PTEN mRNA in I/R group was 2 times that of CM group (P<0.05), and about 5 times that of I/R +miR-21 group (P<0.05, Figure 4). Figure 4: The expression of PTEN mRNA in myocardium of rats. bCompared with sham group, P<0.05; cCompared with I/R group, P<0.05. 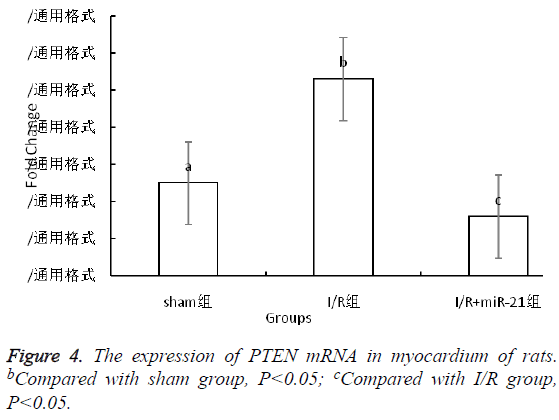 The relative expression of PTEN protein in I/R group was significantly higher than that in sham group (P<0.05). The relative expression of PTEN protein in I/R+miR-21 group was significantly lower than that in I/R group (P<0.05). The expression of PTEN protein in each group was consistent with the expression of PTEN mRNA. The relative expression of pPTEN, pAKTser473, pAKTThr308, pFOX03a and FasL protein in I/R group was significantly higher than that in sham group (P<0.05). The relative expression of pPTEN, pAKTser473, pAKTThr308, pFOX03a and FasL protein in I/R +miR-21 group was significantly lower than that in I/R group (P<0.05). There was no significant difference in the relative expression of total AKT and FOX03a between the two groups (P<0.05, Figure 5). Figure 5: Expression of PTEN/AKT/FOXO3a signaling pathway 1: sham group; 2: I/R group; 3: I/R+miR-21 group. MicroRNA (miRNA) , consisted of 20-24 nucleotides in length, is widely found in eukaryotes. It is an endogenous noncoding controlled single-stranded small molecule RNA. A number of studies have shown that miRNA was an important post-transcriptional regulatory gene, playing an important role in negative regulation by inhibiting the translocation of target mRNA. It was also involved in cell differentiation, proliferation and apoptosis process. MiRNA-21 played an important role in tumor and cardiovascular disease, because of the independent promoter region that was not affected by other promoters of the coding region [6,7]. The previous research found that miRNA-21 plays an important role in various diseases. In the serum of patients with breast cancer, miRNA-21 level goes up, while by lowering PTEN to activate PI3K/AKT signal path and to phosphorylate FOXO3a . And miRNA-21can down-regulate PTEN and up-regulate Akt phosphorylation, causing epithelial-mesenchymal transition of hepatocyte fibering epithelial cell . Similar miRNA-21 expression in cardiovascular system and its affection on related passages remains unclear. Now there is a study regarded that in vivo and in vitro experiments showed that miRNA-21 expression was increased in models of heart failure, myocardial fibrosis and myocardial infarction. The high expression of miRNA-21 in myocardium significantly reduced the infarct size after myocardial infarction . Thus, miRNA-21 had anti-apoptotic effect in hypoxia or acute myocardial infarction [9,10]. Multiple diseases or factors could lead to ischemia-reperfusion injury (I/R) , and the heart was more prone to suffer from ischemia-reperfusion injury due to the large demand for oxygen. Ischemia-reperfusion injury could induce apoptosis of tissues and organs, which was regulated by genes as a form of cell death. Cardiomyocyte apoptosis was a complex pathophysiological process involving the activation of a series of signal transduction pathways . 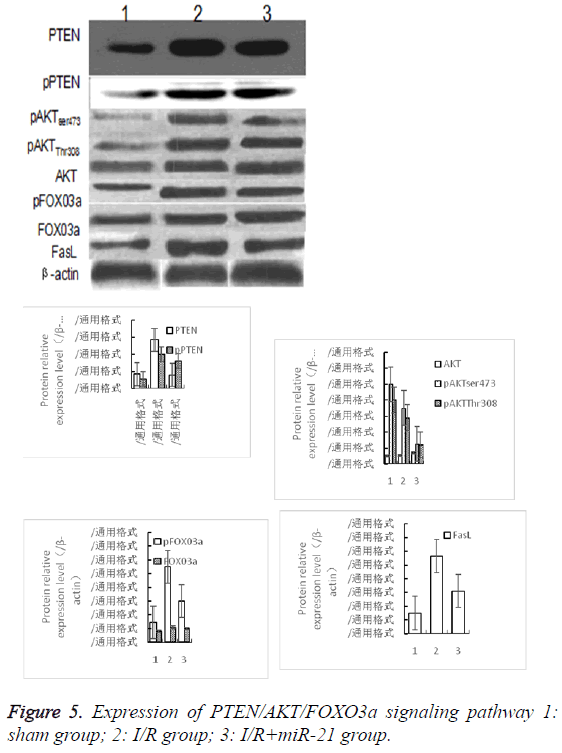 PTEN/AKT/FOXO3a was an important pathway for the regulation of apoptosis. However, it was still unclear whether the signal transduction pathway was involved in cardiomyocyte apoptosis induced by ischemia-reperfusion injury. Therefore, the rat model of ischemia-reperfusion injury was constructed to detect the expression of miRNA-21 in cardiomyocytes. Moreover, the expression and trend of signal pathway-related proteins were analysed, so as to further understand the mechanism of cardiomyocyte apoptosis. In this study, we found that ischemia/reperfusion injury induced cardiomyocyte apoptosis, and cardiomyocyte apoptosis rate in I/R group was significantly higher than that in the Sham group, which showed statistically significant difference. The expression of PTEN was down-regulated by ischemia-reperfusion injury and up-regulated at the gene and protein level, indicating that the expression of PTEN was negatively correlated with miRNA-21. The recombinant lentiviral vector transfected with miRNA-21 could significantly up-regulate the expression of miR-21 in myocardium and down-regulate the expression of PTEN mRNA and related protein. The apoptosis rate of myocardium in miR-21 transfected group was significantly lower than that in I/R group, and the difference was statistically significant, indicating that PTEN was one of the target genes for miRNA-21 on anti-cardiomyocyte apoptosis. PTEN was a negative regulator of P13K/Akt pathway [13,14]. The transcriptional activity of FOXO protein family in regulating apoptosis was realized mainly through the regulation of P13K/Akt signaling pathway. In this study, we found that ischemia-reperfusion injury could significantly increase the expression of pPTEN, pAKT, pAKTser473, pAKTThr308, pFOX03a and FasL protein, while promoting the phosphorylation of PTEN, AKT and FOX03a. The result also showed that the expression of pPTEN, pAKTser473, pAKTThr308, pFOX03a and FasL protein in I/R+miR-21 group was significantly lower than that in I/R group, and miR-21 could inhibit the phosphorylation of PTEN, AKT and FOX03a [15,16]. The effect of miR-21 on the apoptosis of cardiomyocytes induced by ischemia-reperfusion injury may require activation of the PTEN/AKT/FOX03a signal transduction pathway. In conclusion, it was concluded that miR-21 could resist cardiomyocyte apoptosis induced by ischemia-reperfusion injury, and its mechanism may be the mediation by PTEN/AKT/FOXO3a signal transduction pathway. Wang K. Enhanced cardioprotection by human endometrium mesenchymal stem cells driven by exosomal microrna-21. Stem Cells Transl Med 2016; 6. Tatsuguchi M. Expression of microRNAs is dynamically regulated during cardiomyocyte hypertrophy. J Mol Cell Cardiol 2007; 42: 1137-1141. Wei H. Combination of microRNA-21 and microRNA-146a attenuates cardiac dysfunction and apoptosis during acute myocardial infarction in Mice. Mol Ther Nucleic Acids 2016; 5: 296. Yu L. Melatonin receptor-mediated protection against myocardial ischemia/reperfusion injury: role of SIRT1. J Pineal Res 2014; 57: 228-238. Zhi HH, Xin X, She BZ. Relevant research progress of the relationship between microRNA-155 and cardiovascular disease. Cardiovascular Disease China 2015; 13. Qiao S. MicroRNA-21 mediates isoflurane-induced cardioprotection against ischemia/reperfusion injury via Akt/nitric oxide synthase/mitochondrial permeability transition pore pathway. Anesthesiology 2015; 123: 786. Olson JM. Upregulation of microRNA-21 mediates isoflurane-induced protection of cardiomyocytes. Anesthesiology 2015; 122: 795-805. Liu X, Feng J, Tang L. The regulation and function of miR-21-FOXO3a-miR-34b/c signaling in breast cancer. Int J Mol Sci 2015; 16: 3148-3162. Liu Z, Wang J, Guo C. microRNA-21 mediates epithelial-mesenchymal transition of human hepatocytes via PTEN/Akt pathway. Biomed Pharmacother 2015; 69: 24-28. Barana A. Chronic atrial fibrillation increases microRNA-21 in human atrial myocytes decreasing L-type calcium current. Circ Arrhythm Electrophysiol 2014; 7: 861. Qin Y. MicroRNA 21 inhibits left ventricular remodeling in the early phase of rat model with ischemia-reperfusion injury by suppressing cell apoptosis. Int J Med Sci 2012; 9: 413-423. Sayed D. MicroRNA-21 is a downstream effector of AKT that mediates its antiapoptotic effects via suppression of Fas ligand. J Biol Chem 2010; 285: 20281. May T. Ischemia/reperfusion injury following acute myocardial infarction. A Critical Issue for Clinicians and Forensic Pathologists 2017. Y Tingo. Effects of microRNA-21 on cardiomyocyte apoptosis and PTEN/AKT/FOXO3a signal transduction pathway in neonatal rat Nanchang University 2012. Yang Y. OCF can repress tumor metastasis by inhibiting epithelial-mesenchymal transition involved in PTEN/PI3K/AKT pathway in lung cancer cells. Plos One 2017; 12: 0174021. Yu L, Zhang Q, Zhao G, Chen W, Jin Z, Yu S. Effects of melatonin on myocardial ischemia/reperfusion injury and its effect on Notch1/Hes1 signaling pathway. Chinese Heart J 2017; 29: 24-28.